at the Berlin Wall in Muehlenstrasse, 10243 Berlin-Friedrichshain (WestSideGallery, riverside of the East-Side-Gallery, opposite of the 02-hall). 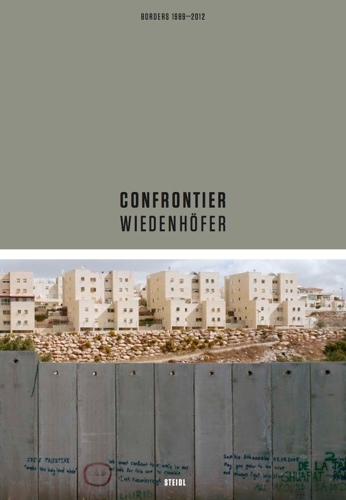 At 19:00 and 20:00 we will project the 43 minute documentary film BORDERLANDS by Fred Kowasch which depicts the genesis of the photographs in CONFRONTIER. The young ensemble of Circus Schatzinsel will perform a scenic improvisation. I will sign books and stamped them with the famous WALLONWALL logo, on 3, October the Day of German Unity I will also be there from 11:00 – 17:00. In 1989, as a first-year university student, I photographed the fall of the Berlin wall in my hometown. It became the very symbol for the downfall of the USSR as a superpower and the end of a world order that had shaped our planet and lives for almost half a century. It was the most exciting and positive political event I’ve witnessed in my life. It was a first hand experience of history in the making which deeply moved me. During that time most people as well as I believed that this would be the end of walls as a political instrument and put them on the garbage heap of history as an anachronistic tool. Twenty years later I have been proven wrong. On the contrary, walls have made a big renaissance. Border barriers went up again in the US, in Europe and the Middle East as the aftermath of political, economic, religious and ethnic conflicts. People have to arrange their lives around them. The fall was for me a formative experience that years later caused me to be shocked and concerned about the erection of the separation barrier in the Occupied Palestinian Territories. 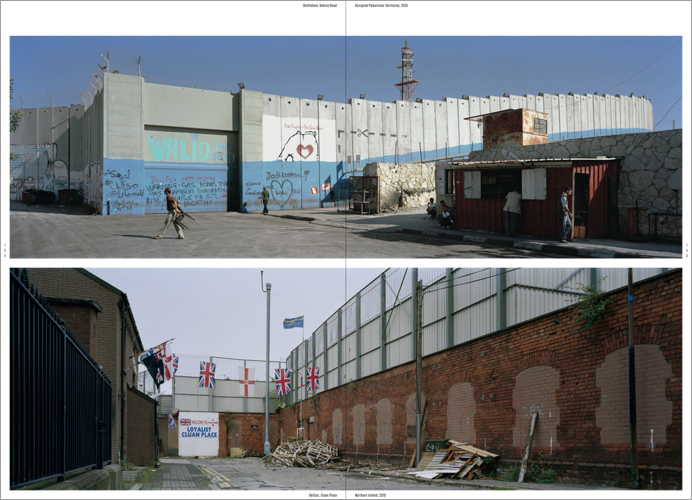 I documented the latter between 2003 and 2006 and published it in the volume “Wall”. 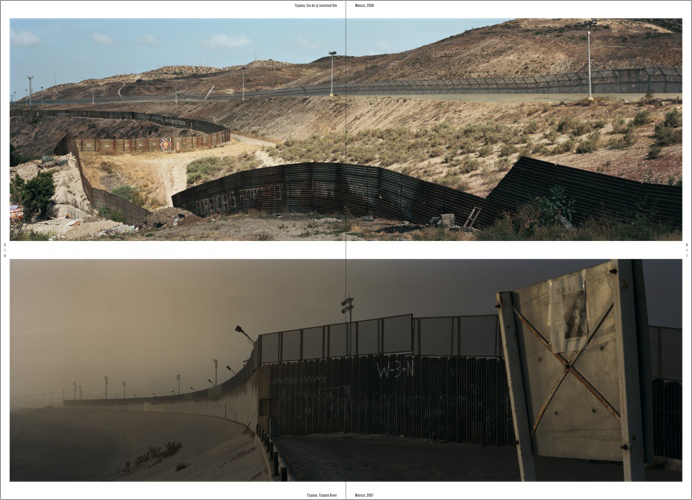 With “Confrontier” I expanded this theme into a comprehensive project about borders worldwide in order to stress that walls and fences of borders are no solutions to today‘s global political and economic problems. The Berlin Wall was the best proof for this – peace begins where walls fall, not where they are erected. A barrier is the proof of human weaknesses and errors, the inability of human beings to communicate with each other. Where all communication is contracted, a solution of conflicts becomes impossible because behind walls the clichés and concepts of enemy mushroom with hardly any relation to reality. The simplest reaction to perceived problems is to build a barrier, to cut oneself off from the others, to separate oneself. Because what comes from outside, from there, can only be a threat, a sign of disaster, the vanguard of evil as the late Ryszard Kapuściński wrote. Approaching a border fills me with apprehension. Human beings are not made for a life in border situations. We avoid them or try to leave them behind as fast as we can, though we constantly run up against them, see and feel them. Borders mean stress, even fear. 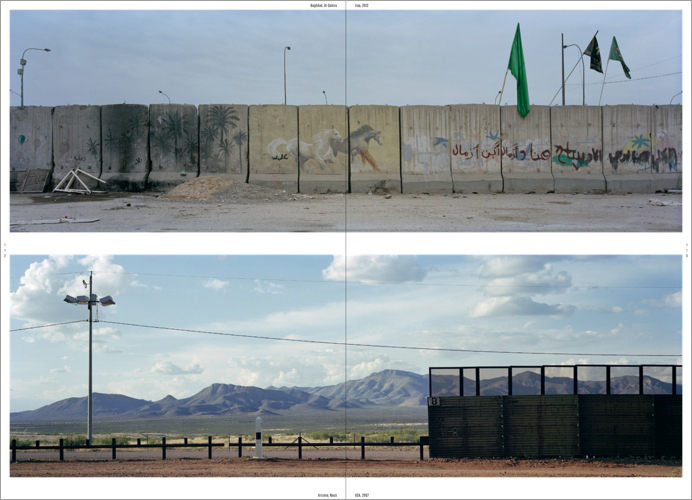 ‘I’m here you are there’ – borders allocate us to places, warn us to stay away. They remind me of jeweller shops with their electronically protected display windows that show us enticing riches, which for most of us are beyond our reach. 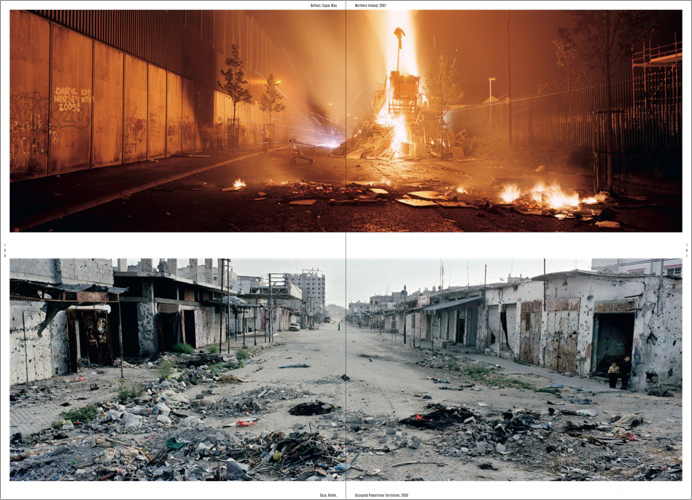 Man-made borders run between ideologies, rich and poor, religion and race. Their significance is not just geographic, but operates principally in our minds. Their architecture disfigures landscapes as well as thoughts. This is the worst aspect of a barrier, that most people develop an attitude of border defenders: Those on the outside are bad, those on the inside are good. One can be far away from the border. 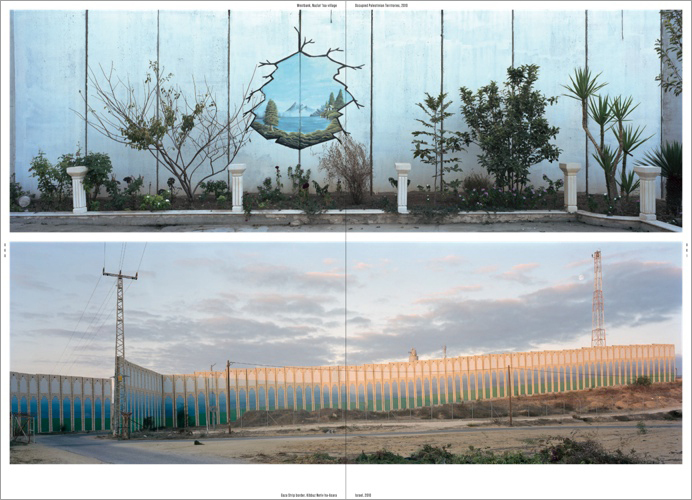 It is enough to have the picture of the border internalized and to follow the logic and rules that the border imposes. Or as Winston Churchill put it: “First we shape our buildings and then the buildings start to shape us”. Globalization promised us an ending, a dissolution of borders. What does reality look like? The trappings of globalization are deceptive: It enlarges markets but also insecurity in the world. While capital moves freely and in seconds, people do not. Many have been unable to participate in the benefits of economic globalization, and the gap between rich and poor is deepening. I want to show the conflict that is inherent in borders: On the one hand we long for unconditional, absolute boundlessness, perhaps because the major world religions describe paradise this way, perhaps because economical globalization (our de facto religion) demands it. On the other, we feel lost in the boundlessness, and want to separate, distinguish ourselves, our culture, our community. While we may admire charity, we are not ready to share our wealth. 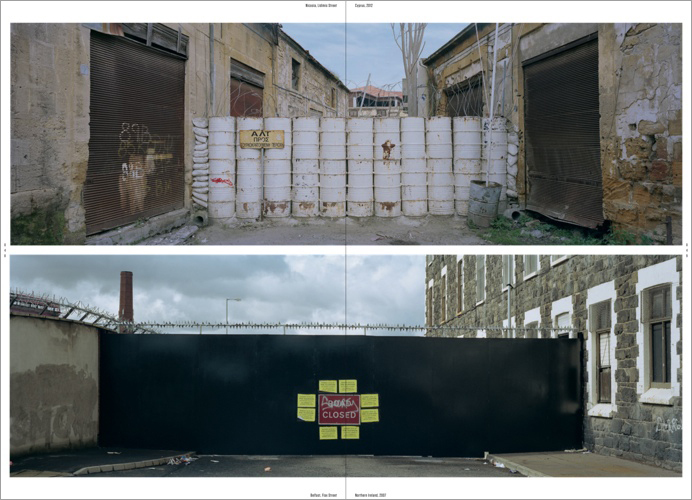 While fundamentally documentary in character, the project aims to illuminate the psychologies of borders, to raise questions and reveal our experiences. Many of us feel that we are but mere spectators. This project intends to reveal us as participants, sometimes unwilling, but participants nonetheless. While barriers are a protection they are also a cage, while being shields they are also traps.